Avega's innovative networked home entertainment system received an Innovations 2007 Design and Engineering Award Honoree by the Consumer Electronics Association for its groundbreaking Wi-Fi audio system. The Distributed Networked Entertainment (DNE) system consists of various devices (multi-room, multi-channel) that provide networked connectivity to audio from any device for playback on any loudspeakers. Signals are sent via 802.11a/g/n and/or Ethernet plus there is support for emerging networking standards (i.e. HomePlug AV) with the ease of plug-and-play functionality. 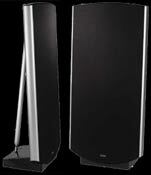 Definitive Technology's Mythos One ($899 each) floorstanding tower loudspeaker will be at the 2007 CES and consists of three tall, sleek silver units. Elegant curves of hand-polished aircraft-grade aluminum are combines with state-of-the-art engineering plus proprietary damping technologies that ensure total rigidity. The D'Appolito driver arrays and Linkwitz-Riley crossover networks help round out this design. Driver compliment includes a 1-inch aluminum dome tweeter. two 5.25-inch midrange drivers, two 5.25-inch bass units, and two 5.25-inch pressure-driven planar technology bass radiators. Dimensions are 6 x 6 x 47 (WxDxH in inches), sensitivity id 92dB/W/m, and overall frequency response is from 20Hz to 30kHz. BEWITH of Japan will show their Monitor H-1, claimed to be the "ultimate monitor speaker with perfect harmony of advanced technology and Japanese traditional beauty with craftsmanship." A precision aluminum die cast ported enclosure is has no vertical lines inside to minimize unnecessary sound reflection and diffraction to virtually eliminate standing wave. The front and back aluminum die cast moldings are welded to be monocoque (seamless structure) for controlling precise piston motion of the units. Driver compliment consist of the company's C-50 tweeter and C-130 midrange/woofer and are installed as close as they can be, noting the front enclosure has 7 degrees of lean for time alignment purposes. Following ancient and well-respected Japanese traditional, the cabinet features Urushi painting/finish. Longstanding loudspeaker manufacturer Quad Electroacoustics will be showing the company's ESL-2905 full-range electrostatic point-source loudspeaker. The new ESL-2905 Electrostatics are Quad's latest reference unit with patented panel technology that results in a combination of speed and accuracy with a near theoretical ideal point source of sound production. Quad's ESL-2905 has 8 electrostatic panels, the inner two utilizing the concentric rings of anodes used to create the point source image. While all electrodes receive the same music signal, each electrode area reacts slightly differently, such that treble frequencies appear to come from the center of the speaker. The outer panels (three above and three below) are linear panels. Construction is a combination of tensioned aluminum extrusions coupled to stainless steel support structures, with a piano gloss wooden trim. Base construction is finished with piano gloss sides. Herron Audio's new VTPH-2 vacuum tube phonostage offers external cartridge loading that can be changed while listening. The "virtual bias" scheme of the VTPH-2 allows for operation with infinite moving coil (MC) MC input impedance (no load) plus Neutrik (male) RCA plugs with loading resistors. Moving magnet (MM) inputs can be switched from MM to MC with the touch of a switch. Internal switching is electronic and the unit automatically mutes for 15 seconds during MM/MC mode change. Tube complement consists of four 12AX7 and a 12AT7. Frequency response is from 20Hz to 20kHz (�0.1dB), with a gain of 66dB for MC and 44dB for MM. 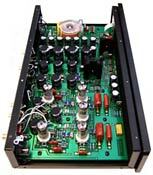 See review of the Herron Audio VTSP-1A preamplifier and VTPH-1MM phonostage by clicking here. The Herron Audio M-150 amplifier review can be seen by clicking here.